Food writer Clementine Paddleford made it her mission to find the best in American cooking. One place she found it was the Pillsbury Bake-Off contest. Most people are familiar with this iconic competition, which began in 1949 and is still alive and well today. Clementine knew she would find recipes from the best home cooks in America at the Bake-Off. Not only did Clementine attend many of the contests, she was also asked to be one of the judges more than once, which probably thrilled her to no end. Clementine loved judging contests. 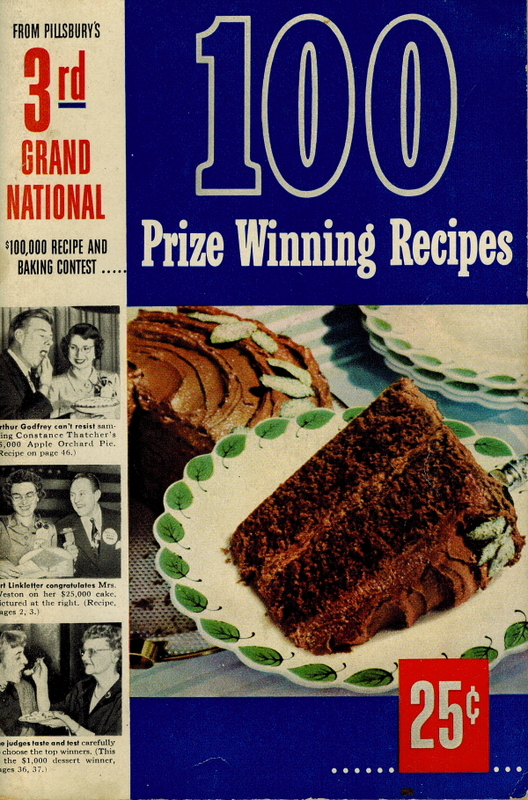 Clementine was a judge at this 3rd Pillsbury Bake-Off contest in 1951, at the time known as the Grand National contest. 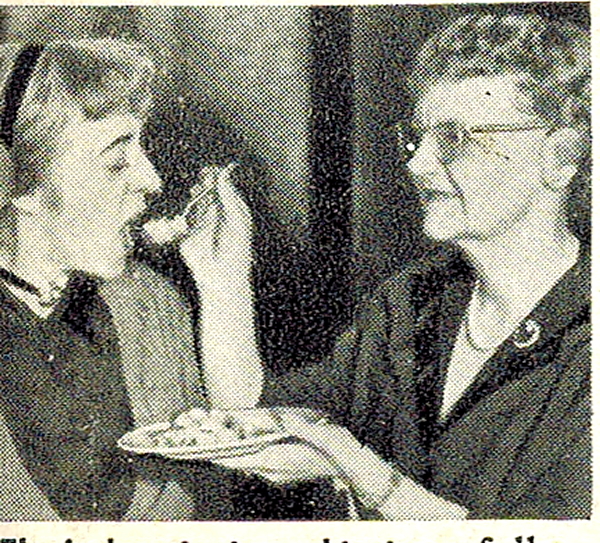 The winning recipe, “Starlight Double-Delight Cake” was the $25,000 winner . I am not surprised that a chocolate cake won at a contest where Clementine was a judge, as she was once quoted as saying, “Chocolate Cake- that’s my meat!” The cake is also very delicious. You can find the recipe and details of the contest on one of my earlier blog pages. Clementine is on the far left and seems to be carefully examining the entry. Clementine on the left, tasting one of the entries. When I was researching the archives of Clementine Paddleford at Kansas State University this past summer, I was thrilled to find many papers from her experiences at the Bake-Off. I am not sure on the exact number she judged, but even when she wasn’t judging, Clementine still attended the contest. I found her New York Herald article from the 4th contest, and she mentioned that the entries were up one-third more than the contest the year before, numbering in “the hundreds of thousands.” There were ten judges (Clementine included again) who spent nine hours selecting the winner which Clementine called a “Herculean task.” To keep the taste buds refreshed between entries, the judges would eat pickles and celery or drink tea, black coffee, clam juice, tomato juice, or ice water. Outside the judging room on the cooking floor were 79 women, 1 man, and 20 teen-agers working furiously to win the grand prize of $25,000. All contestants that year would also receive General Electric appliances such as refrigerators, freezers, and automatic washers. In addition, each contestant would receive the range they used in the contest, an electric mixer, and even the chair they sat on! Along with Clementine’s Bake-Off information, I came across a lengthy paper written by a Pillsbury lawyer named Terry Hanold which he titled, “Why a Lawyer Should Learn to Bake a Cake.” The individual interest of the contestants as well as those of his company was Hanold’s job since the first Bake-Off, which actually, almost didn’t happen. Negotiations were complete for the first Bake-Off, a deal to install the electric outlets were set, and advance registration for the 100 contestants at New York City’s Waldorf Astoria were ready. Advertisements were prepared and the contest readied for the big announcement to America’s cooks. Then disaster struck. A magazine called to say that they would not publish the advertisement for the Bake-Off. They said the contest was nothing more than a lottery and that the United States Postal Service would confiscate each and every copy of their magazine issue. Hanold was in bed with the flu when this news came, but still clambered aboard a plane for Washington, DC and a conference with Postal Authorities. As Hanold explained, they “sat like bulldogs facing each other across a desk.” Finally, Hanold saved the day and went back to bed. Later, another problem arose with the judging criteria. Hanold wanted to make sure that by no means would Pillsbury Mills be involved in the judging of the contest, so that the company could not be accused of judging its own contest, which would put it on the highest level of fairness. 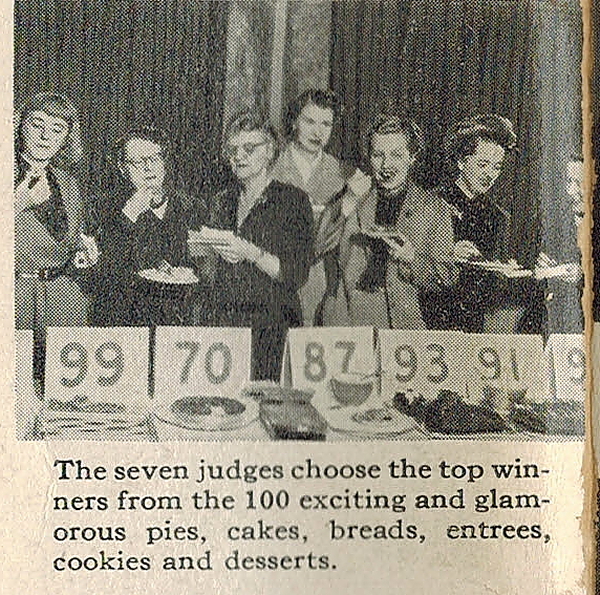 It was decided that selection and judging of the prize-winning recipes would rest entirely on the shoulders of the Lloyd Herrold Company, and Harvey and Howe Kitchens in Chicago would narrow it down to the 100 finalists, with magazine and newspaper food editors picking the final winners the day of the Bake-Off. Now the Bake-Off rules and regulations were complete and legal. Friends of Pillsbury, along with friendly competitors, began to forecast what the Bake-Off floor would be like on competition day. “Gimbel’s basement in a bargain sale,” some said. “The original pancake day race in Olney, England,” and even “You’ll have more hair-pulling, snatching, and pots and pans flying through the air as they battle for those thousands of dollars than in a comic movie.” Hanold, of course, never believed any of this for a minute. He remembered that of the main ingredients in his recipe for work was an ounce of prevention is worth a pound of cure. Hanold decided the contestants would be treated royally, with breakfast-in-bed on baking day, along with a meeting with contestants to explain all the rules. It worked. As the contestants entered the ballroom in the “Grand March” (which still happens every Bake-Off) they “entered like lambs, gossiped across their ranges as though they had been next door neighbors for years.” Hanold’s work was done and he walked to his makeshift “office,” the judging room with ten food editors to start the process. He would be legally responsible for watching the arrival of the silver-domed “traymobiles” with the entries, and insuring the protection of each contestant. Hanold also had the task of keeping people out of the judging room and keeping the judges in. It was decided that the judges would not go out on the baking floor or talk to any of the contestants, and see the entries only by a code number. However, he had to bend a rule just once. At the first Bake-Off, the Duke and Duchess of Windsor were the honored guests. As they entered the contest floor, the judges chorused, “PLEASE Terry, let us go out there and see them!” Hanold was forced to let school out for a few minutes. I am guessing that has never happened since. Well, unless William and Kate show up someday. As the baking continued on the floor, an excited executive entered the judging room calling frantically for Hanold. It seems one of the teenage contestants was in a flood of tears because one of the Waldorf bus boys, anxious to pick up dirty dishes, had whisked away the girl’s batch of apple dumplings. “I could never bake them as good as that again,” she cried. They were the best I ever made!” The dumplings could not be recovered, and Hanold quietly and calmly persuaded her to try again, and told her she could have all the time she wanted. An hour later, with a smiling face, the contestant presented a new batch for judging with the remark that they were just as good as the batch that was taken. Later, the contestant from Hawaii was finding it difficult to cook because the media wanted her to pose for photos with a lei around her neck and dance the hula! Hanold informed the media to stay away while she cooked and “no more posing.” Finally, at 6:15 that evening, the judges were down to the last three entries, one which would win the grand prize. They kicked off their shoes, sat in a tight little circle and claimed to feel a little dizzy at their responsibility of giving away so much money. A decision was finally made and the winner was presented with the winning check the next day by Margaret Truman. (quite the royalty at this contest, don’t you think?). This weekend, my daughter Kristina and I will be covering the 46th Bake-Off contest in Las Vegas, from November 9-12. Kristina and I are both former Bake-Off contestants and love going as media as much as we did being contestants. In Wednesday’s blog, read about where Pillsbury sent Clementine as a member of the media. You won’t believe it! Stay tuned all weekend and early next week for all the exciting Bake-Off news. It will be great, but I’m not holding my breath for William and Kate to show up. I think they are a little busy. How fun! Have a great time. Can’t wait to hear all about your trip. Couldn’t agree more, Lisa! Harold sounds like a jewel. I didn’t think I could get any more excited but this did it! I have enjoyed Clementine’s adventures leading up to this year’s Bake-Off Contest and looking forward to seeing you in Las Vegas! It’s going to be a blast, Brett! Can’t wait to see you, too! Do you think Terry Hanold would approve turning the iconic Pillsbury Bake-Off into a voting contest? Love the Pillsbury Bake Off . What an amazing history. Rally feel bad about the voting this year. Hope the voting element goes away . Andrea, I would think no, he wouldn’t like it much. Then again, he sounded like a positive type of person and probably would have figured out a way to convince people it was something new and exciting for our technology-driven world. See you in Vegas, Heidi, and best of luck!